Just because something is vintage inspired doesn’t mean it has to take decades to make. Actually, this card from craft designer was a quick one. 1) Cut the following- 51/2″ X 11″ from white cardstock to form the card base, 5 1/2″ square from decorative paper and 4 1/2″ square from light brown cardstock. 2) Distress the light brown paper by folding it in half and applying the light brown ink to all the edges. The fold it in half in the opposite direction and apply more ink to the edges. Apply the light brown ink to the edges of the decorative paper too. 3)Ink up the script background stamp with Cookie Dough and stamp onto brown square. Ink up the sentiment in Wicked Black and stamp onto the panel using the photo for reference. 4) On white cardstock stamp flower. Use lightly wet watercolor pencil to age the flower. 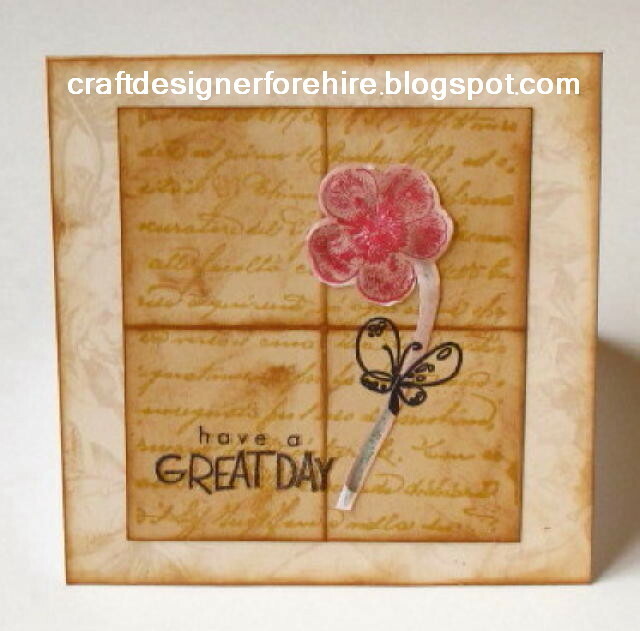 5) Assemble card and stamp butterfly using Wicked Black.